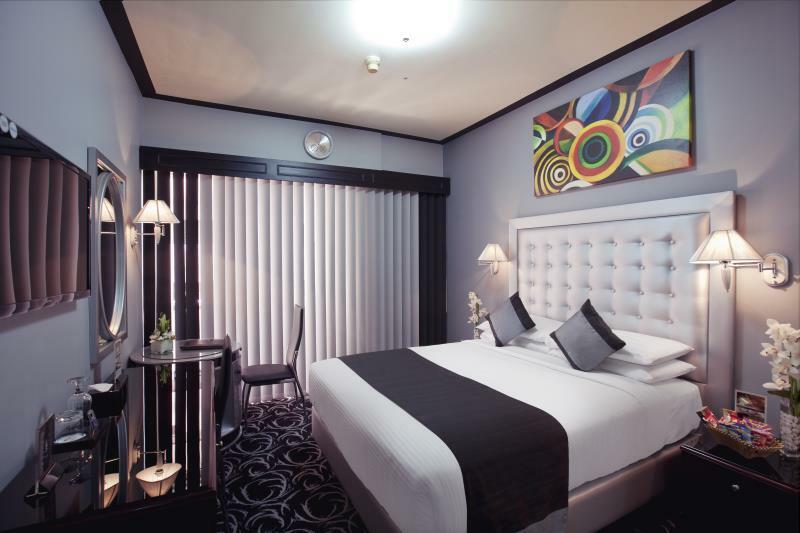 The hotel centerly located in heart of Deira . The rate was very resanable or even low . this hotel was charge wi-fi 90 drham . So no free wi-fi. Also the room was not clean. It was great hotel , staff was great , value for money , we stayed for 3 nights and had nice experience . We will recommend our friends to stay there specially all single guys and couples . They will enjoy the night clubs . 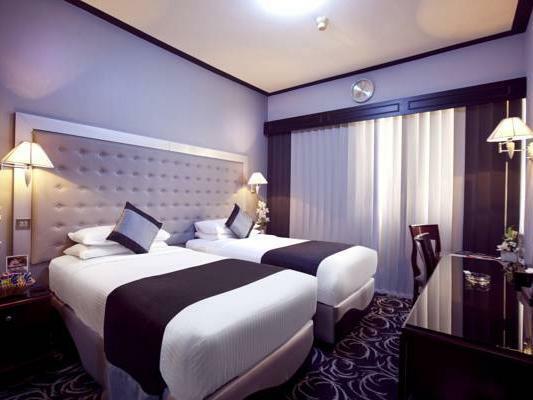 This Hotel located in a very nice location, the service was excellent the food was great. We get a very good deal through Agoda website, normally the double room with Breakfast costs around 400 Durham/per night, it costed us 210 Durham/per night. It was a pleasant stay, although the rooms were small they were very clean and well furnished. The staff were also very pleasant and courteous. The only drawback were the clubs in the hotel, which were quite noisy. Encountered a few ladies in revealing clothing in the lift one late night. If you have young children, perhaps this hotel may not be suitable. If you are a light sleeper, bring earplugs. We find the hotel alright as we were out all day and need only a place to sleep in. There is a restaurant and supermarket across the road so it was convenient. Easy to get taxis too. Good value for money. This is a budget hotel with a friendly staff. It's not in the best area but close to the airport. The rooms are small but clean. The bed is comfortable but the pillows were extremely hard for my liking. I would not recommend to families. There are a few night clubs in the hotel which stay open until 3am. So if your looking for a peaceful nights rest this is not the place to stay. For those travelers wondering if this is a guest friendly hotel, it's not. I like this place .it is near a vary of restaurants. Room service was very slow. The rooms were outdated and old-fashioned. They didn't put any complementary water bottles in the room and when I called room service asking for water they said that I have to pay for and it cost 15 derhams. It was very expensive. No parking, using a far parking taking 15-20 minutes to bring the car to you, no lobby at all, no decent cafeteria to take tea or coffe, only very noisy desco club adjacent to reception desk all night, even you can not hear the receptionist and it is full of bad ladies It was a very bad experience. The room is ok. Clean beds, toilet is clean. TV is unclear, breakfast not as i expected, and the location of the hotel is abit far from the Al Rigga metro station, roughly abt less than a 10 min walk. Hotel is loud has several night clubs but it does not bother me if i am in the room. Lots of people in the clubs I have been here several times it had gone down hill but this time i enjoyed my stay. may not stay at the hotel again but enjoyed the downstairs club. I was unable to get any sleep during my stay because of the loud music and people having inappropriate yelling in the hallways in the middle of the night. Once the disco would shut down for the evening the morning prayer is served to you from loud speakers. The windows did not insulate from any of the outside sound and once the morning prayer is over the constructions starts at 6:00am. I would not recommend taking you family to this hotel but if you absolutely no place to stay and are single this would be ok for maximum 2 nights. Make sure you leave plenty of time for checkout as it took them overs 30 minutes to figure out there are no additional charges they can hit me with, while keeping my passport hostage!